All the software seen here was created by Adventus, developer & publisher of leading music learning programs & solutions, including MusIQ HomeSchool. The most exciting and effective way to help young children learn to read music, play piano with both hands, compose and improvise. Fully narrated and animated with large attractive characters, the program is interactive and comprehensive. Engaging activities introduce theory and ensure young students have a positive and enjoyable early music experience. Five new composer teachers introduce more advanced concepts, increasing students’ musical knowledge, composition, piano playing and improvisation skills. Seven exciting new composer teachers cover more advanced theory and repertoire. Completing the Series ensures students have solid foundation in piano and music literacy, and are ready and keen to continue their musical development. An interactive music learning, playing and composing system that guides students with the help of immediate and continuous feedback. 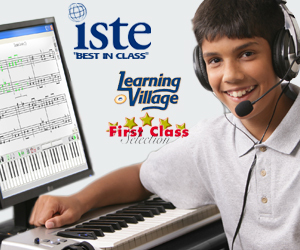 With 5 skill levels from beginner to intermediate, Piano Suite satisfies a broad range of tastes and abilities with hundreds of narrated lessons on notation, music theory, sight-reading, and playing.The learn-to-play library includes 500 pieces; with 65 by: R.E.M, The Beatles, Boyz ll Men, Barbra Streisand, Whitney Houston, Elvis Presley, Bryan Adams, Willie Nelson, Frank Sinatra and many more. Students can develop their musical ear in a self-paced learning environment. What previously required an instructor’s undivided attention is now possible to achieve at home, every day. Packed with thousands of exercises to develop aural perception and sight-reading ability, the program identifies areas for improvement and provides detailed evaluations.